Videos posted on social media show the chaos that ensued after gunfire broke out in Dallas during a peaceful protest on July 7. 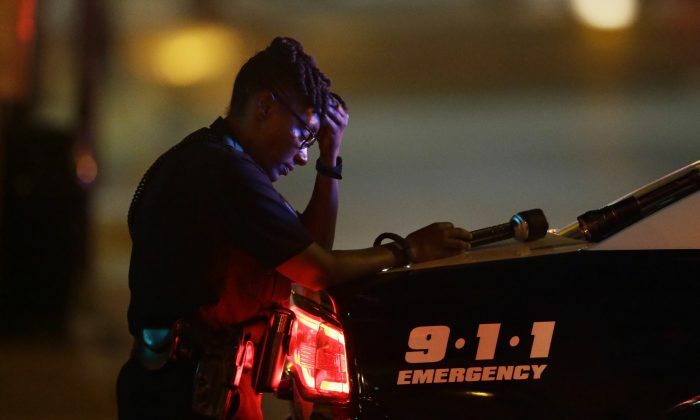 Five officers were killed when sniper fire broke out in Downtown Dallas at around 8:45 p.m. as hundreds of protesters had gathered to demonstrate against two fatal police shootings this week in Baton Rouge, Louisiana, and suburban St. Paul, Minnesota. Seven other officers and one civilian were also injured. Dallas Police Chief David Brown told reporters multiple snipers fired “ambush style” upon the officers. One suspect was killed by a robot with a bomb that police sent into a parking garage. Brown said officers negotiated with the suspect and he “seemed lucid during this negotiation,” but he expressed a wish to kill white people, especially white officers. Three other alleged suspects are in custody. “If anyone else is involved in this… We will find you and we will prosecute you and we will bring you to justice,” Brown said. An official identified the gunman as 25-year-old Micah Johnson, according to The Associated Press. The gunman had told police he acted alone. The ambush-style attack is the deadliest on U.S. law enforcement since 9/11. Footage shows how the demonstration was interrupted by gunfire, as people ran to take cover. A separate video posted on Youtube shows a peaceful protest disrupted as shooting begins. The crowd quickly disperses as police cars rush in. Videos show witnesses in shock from the ongoing exchange of fire between the gunman and police. In another video, shots are heard inside El Centro College, where the gunfire took place around the parking garage. A video posted on social media appears to show a gunman exchanging shots with police officers. President Barack Obama, who is in Warsaw, Poland, where he’s meeting with leaders of the European Union and attending a NATO summit, said the country is “horrified” over the shootings of police officers. “I speak for every single American when I say that we are horrified over these events, and that we stand united with the people and the police department in Dallas,” said the president. “Let’s be clear: There is no possible justification for these kinds of attacks or any violence against law enforcement,” he added.